Broth is a thin soup in which meat, fish or vegetables have been cooked in water. Ryan's mom gave him chicken broth with vegetables whenever he was sick. 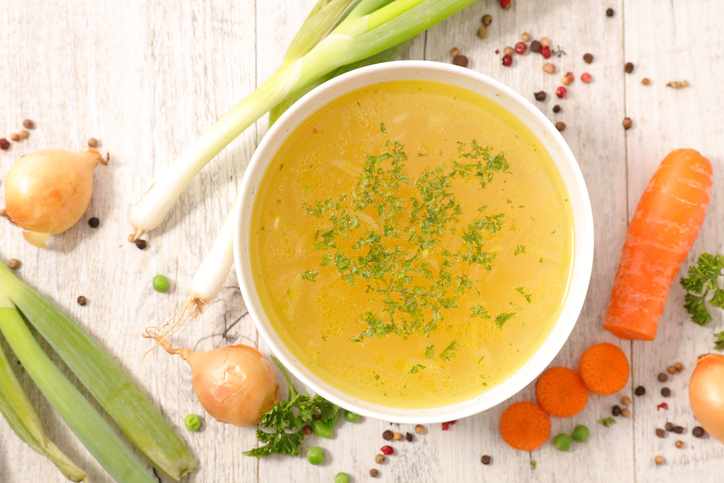 For the best results, cook your vegetable broth overnight, and then throw away the vegetables. Rice cooked in broth has great flavor. Do you know the difference between broth and stock? Broth is made primarily of meat, and stock is made primarily of bones. Stock is richer and has more protein. Stock also benefits your hair, nails and bones. You may also hear about bone broth, which is another name for stock. Watch this video to learn how to make a very rich chicken stock. It’s tasty by itself, or a good base for any soup or stew. There are other meanings of broth.